Every Ramadan, the Toronto-area MMW contributors try to have an iftaar. This started a few years ago when our wondrous Editor-in-Chief, Krista, invited us all to her parents’ home. It was the first time I met Amina in person. I remember sitting in my car some three Ramadans ago and both of us just let rivers of conversation flow between us in a train station parking lot. We laughed. We cried and then we went and bought a basil plant to give to Krista. It would be an understatement to say we bonded. Another evening, Kirstin was there too. We talked, we prayed and we ate. We savoured the company of women with whom we interacted with regularly online. To meet in person was tremendous. To offer a hug and vent about systematic misogyny in person, in addition to the support we give each other over the internet, is a blessed thing. Since then, when other contributors have been in town, we have tried to connect in person. There are so many combinations of MMW writers (current and past) who have made an effort to meet and to hang out and take selfies. This Ramadan was no exception. Eren has become our social convener. She invited mostly everyone and we picked an evening to break our fast together. We decided on a Friday night that suited as many people as we could: Eren, Amina, me and Sobia. We set our plans and even decided on what to bring. Then things changed. Not too far into the Holy Month, tragedy struck. Less than one week after the world mourned for the incredible Black Muslim hero, Muhammad Ali, the Orlando Massacre unleashed a horror that shook and terrified so many communities. Pulse nightclub was filled with mostly brown and black Queer Latinx bodies, and the killer, Omar Mateen, violently took the lives of 49 people. The aftermath of the shooting highlighted the toxic mix of racism, homophobia, and Islamophobia. We heard stories of our friends and love ones wrought with distress, as Queer communities needed support and comfort. Muslim leaders made statements, and some Imams posted on Facebook. Voices of Queer Muslims and Queer People of Colour began to ring out. Many of the pieces in tribute were harrowing. Beyond these, there are still so many that cannot speak freely; who cannot fully mourn; and those who can’t publicly offer the support they want to. An image from the unity iftar in Toronto. Via Now Magazine. A group of people in Toronto from Muslim, Queer (also both!) communities felt similarly and organized an iftaar in Toronto with each other to support each other and denounce rising Islamophobia and homophobia. Ultimately, that is where our little MMW group ended up going. 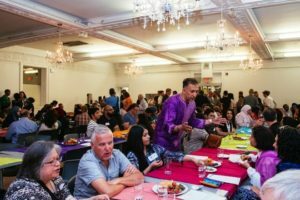 For straight Muslim allies, it was an opportunity to show up and break the fast during this Holy Month in peace and in solidarity. And listen to how communities are hurting by the horrific events in Orlando. Listen to how media is not talking about the targeted attacks preyed on vulnerable Latinx communities. Listen to why the Pulse nightclub was a safe haven for many Queer folk. Listen to how and why the intersections of class and race and gender identity are so important to talk about. Some of the speeches were heartfelt and intense. Some were softer and thankful for the opportunity to be in a space where so many different people could come together to share in their grief and in their humanity. Eren told me that this was a crucial part of the evening. I wondered to my friend Selma why there weren’t more ‘mainstream’ Muslims there that we knew. We are part of a HUGE community in Toronto. I had taken into consideration that the event was planned so quickly. “Why aren’t there more people here?” I asked her. “Our people only talk when it affects *them*,” Selma mused. “That’s not how solidarity works,” I said. “That’s not how Islam works,” she replied. I haven’t stopped thinking about that. After we indulged in a wonderful dinner and chatted with new friends and met old ones. It was a night that had a heavy underlying message and that was so important to attend. Some members from the Muslim community signed a very strong statement (available here in PDF) condemning transphobia, homophobia and bigotry. The statement was read out loud at the dinner. Being able to support marginalized and racialized communities is part of what Muslims need to be doing. I left the left the dinner with a sense of happiness and a sense of understanding. There are many roads to be paved to create inclusive spaces in our community. Here’s hoping that we start making new ones. And also that we continue spending time together as a community that learns and grows, insha’Allah. Do Muslim Feminists Have Too Much to Worry About Already to Think About Homophobia?